PalmCast Live hits again tonight at 8pm Eastern. Set your alarms, synchronize your watches, and clear your calendars. 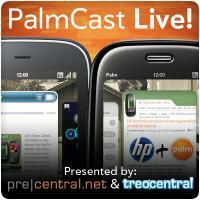 Tweet us with the #palmcast hashtag. Email us at podcast@precentral.net. You cannot send us snail mail. Well, you can, but it won't arrive in time. Join us at 8 PM Eastern, won't you?